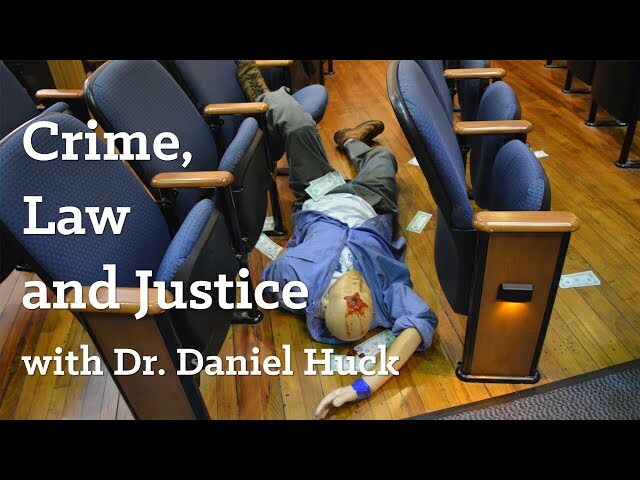 Dr. Daniel Huck's course "Crime, Law and Justice" is one of dozens of GSTR 110 general studies writing seminar courses that emphasize writing, reasoning and learning as foundations for continuing academic success for Berea's first-year students. Course description: This course is designed to help students with transitions from their past experiences to the challenges of college academic life and culture, also emphasizing writing, reasoning and learning as foundations for continuing academic success in general education and beyond. Each section of the course involves explicit, continuing attention to writing, reasoning, research and reflective engagement with various texts, written and non-written. All sections initially address students about the nature of education, liberal arts education, and links to lifelong learning and living. Course focus: Helping students navigate the belief systems they’ve inherited from parents, teachers and friends; finding middle ground within today’s political and social polarization; and exploring debate as a means of inquiry. An assignment: Argue for a position you don’t believe in (such as the belief that the earth is flat). A useful class activity: Modeling the process of reading deeply, through reading aloud, pausing, reflecting and posing questions. A teaching challenge: Given diverse ages and backgrounds, finding common cultural reference points—like Snapchat and texting. Some key readings: Alan Burdick, “Looking for Life on a Flat Earth,” New Yorker, May 30, 2018; Jenna Wortham, “How I Learned to Love Snapchat” and Michaela Cullington, “Does Texting Affect Writing?” and Gerald Graff, Cathy Birkenstein, Russel Durst’s, They Say/I Say: The Moves that Matter in Academic Writing with Readings (4th ed.). What he loves about teaching the course: Interfacing with first-year students—helping them acclimate to college life and find balance among academics, labor, social life and sleep. What he hopes students will take away from the course: Writing—and whatever you want to do well—is never finished; starting early gives you time to come back to it and revise. Course focus: Exploring the human activity of story-telling, understanding that there are different ways to tell stories. An important question: What purposes do our stories serve? Some key readings: Naguib Mahfouz, Miramar, a contemporary novel set in Alexandria, Egypt, where the same story is told from different characters’ perspectives; Bamba Suso and Banna Kanute, Sunjata, a 14th century African epic about the creator of the Mali empire; Vikram Seth, The Golden Gate, a narrative set in San Francisco and written in sonnets. A useful class activity: Exploring the relationship between son and father in Art Spiegelman’s Maus, a graphic novel about the Holocaust, by sharing journal writing in small groups, with each group producing a visual cluster of ideas and examples from the novel. A teaching challenge: Helping students understand the difference between opinion and analysis. A surprise: How capable and energetic the students are, how ready they are to think. What she loves about teaching this course: Applauding students’ small victories, helping them build confidence in their ability to make a successful transition to college. What she hopes students will take away from the course: Your stories—and everyone’s stories—matter. You need to read critically the stories you hear. Course focus: Examining published historical accounts (stock stories) of Progressive Era events related to race, race violence, eugenics, labor and immigration, and researching additional perspectives on events (concealed stories) to understand better the complexities of history. Key readings: American history texts plus research on events such as the 1830 Indian Removal Act, the 1906 Atlanta race riots following the showing of the film, Birth of a Nation and the rise of the Black Panthers in the 1960s. An assignment: Filling the gaps by creating a newspaper of five stories on issues the course addresses, reported from multiple perspectives. Together, the class’s newspapers cover about 150 events; each student selects a topic to explore in-depth in an essay. A teaching challenge: Structuring the class to provide a broad array of ideologies, events and people. A surprise: At midterm, only one student had missed a class (for a family illness), and no students were missing any assignments. What she loves about teaching the course: How thirsty students are to learn. What she hopes students will take away from the course: Find role models for their own actions and gain the courage to speak their truth—a minority voice is important. They may not win, but they can always resist. Course focus: Exploring the phase of human development where individuals begin launching from their families of origin, seeking independence and navigating challenges to identity, experiencing and reflecting on uncertainty, freedom and self-discovery. A key reading: Osgood, et. al (2017), Six Paths to Adulthood, which identifies six different models for ways emerging adults successfully launch themselves through their 20s (fast starters, parents with careers, educated partners, educated singles, working singles and slow starters). An assignment: Identify an important adult role model in your life and explore the trajectory that person experienced. A useful class activity: Discussing personal role models—learning becomes more substantive when students hear raw, real-life experiences. A surprise: Students’ attitude toward writing. Learning how to be a college-level writer is stressful. Students take constructive criticism rather well and really do want to learn to write better. A teaching challenge: Understanding and addressing the urgency felt by many international students who don’t have the luxury of exploring next steps—they have to go home to find a secure livelihood and/or start a family. What he loves about teaching this course: Asking students to develop a support network on campus and knowing they’ll leave the class having connected to people on whom they can rely for help. What he hopes students will take away from the course: Know that it’s okay to spend your 20s figuring out who you are and what you want to become. Who you think you are and what you want to become in the future may surprise you. GSTR 110X, Zombie Apocalypse: Are We Prepared? Course focus: Through the frame of a zombie apocalypse, examining how infectious disease outbreaks, epidemics and pandemics occur; how public health officials respond; and what ethical issues arise in trying to prevent the spread of disease. A useful class activity: From the perspectives of the Center for Disease Control, the World Health Organization and officials in China, investigate the Hong Kong 2003 SARS epidemic, tracing its cause (a new coronavirus) and point source for pandemic spread (elevator button, 9th floor of Hong Kong hotel) and assessing local and global responses. An assignment: Examine a zombie-related issue, such as the origin of the idea of zombies or personal preparation for a zombie apocalypse. Some key readings: Max Brooks, World War Z: An Oral History of the Zombie War (also a film); Steven Schlozman, “Neurobiology of a Zombie,” Scott Mirabile, “The Psychology of Surviving the Zombie Apocalypse,” and Amy Thompson, ed., But If a Zombie Apocalypse Did Occur: Essays on Medical, Military, Governmental, Ethical, Economic, and Other Implications. What she loves about teaching the course: Being able to animate a serious and important issue—protection of the public’s health—through a light-hearted approach. A teaching challenge: Making sure content is diversified so students with different backgrounds in science will be able to find ways to engage. A surprise: The range of students’ responses to the topic of zombies. What she hopes students will take away from the course: How to think critically through a topic: identify reliable sources, assess evidence for claims, see multiple sides.